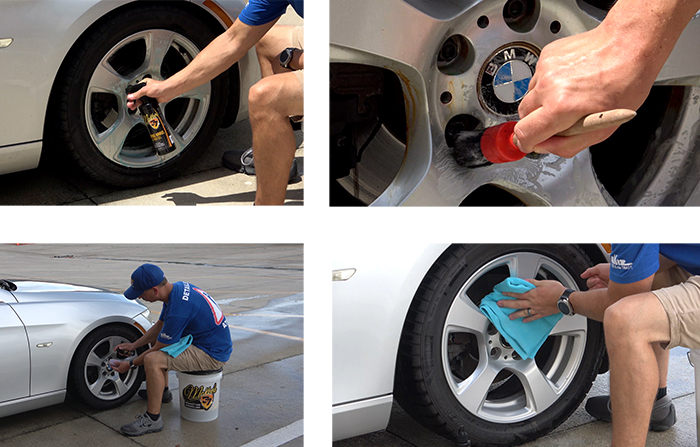 McKee's 37 Wheel Coating is the best wheel wax for your wheels! Wheel coating 5 This stuff is amazing. I live in the Midwest and we have been getting snow and ice. I have my winter tires and wheels on. So I got this stuff to try for my new wheels when I put them on and it work amazing. The snow and salt just wont stick to the wheels. Nano glass Ceramic coating 5 Purchased this product after I bought my new after market wheels, VNR 710, to fit on my BMW. The manufacturer VMR, told me to clean the wheels with nothing but elbow grease and only what I put on my paint, no "wheel cleaners" in any form. I purchased this so that I might keep the wheels as clean as possible from dirt and brake dust. It is a weekend car and have had it out only three times since I nano coated them, but so far, the results are very impressive. Little dirt sticks and they are easy to clean with just medium pressure water...I also bought the foaming wheel cleaner gel, and in some back and forth communication with McKee's, was told it's safe to use on my wheels...yet to try but will in the next few weeks as the rains are pretty constant. Pros:Easy to apply, good results so far...yet to see the results from major miles driven. Cons:A little pricey but if it works, it's all good. You usually get what you pay for. Wheel coating is awesome so far! 4 Decided to give this product a shot, just because I like to try new stuff. Had a brand new 2018 Audi A3 come in for the full works. Gave the wheels a cleaning and dry. Application really couldn't be any easier. A few mist on a applicator and wipe on. Didn't experience any extra product during application. A gave all the wheels a quick polish with a towel afterwords and they do shine! Only giving 4 stars for the time being, not knowing the life of the product. I will be seeing this car for regular maintenance so time will tell. Fantastic 5 I applied this Wheel Coating to my winter wheels. After a week of driving in rain and clear weather the brake dust and dirt rinsed off with just a rinse from the hose, no pressure washer used. The hydrophobic properties are also great. I would heartily recommend the purchase to anyone. Pros:Excellent performance and great price point.